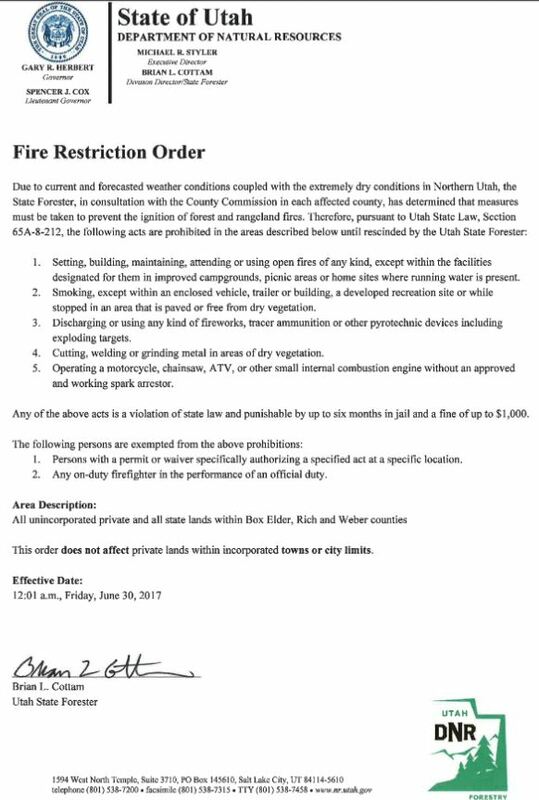 Due to extremely high fire risks and with the upcoming Pioneer Day Holiday and all the festivities surrounding the state holiday, the Tremonton City Council has instituted a ban on the use of all fireworks for two areas within city limits where fire danger is considered to be unusually high this summer. At a meeting Tuesday night, the council voted unanimously to ban the discharge of fireworks in the northwest part of town in an area north of the Highline Canal, west of 2300 West and east of I-84. That area consists largely of open fields, but also includes several dozen homes. 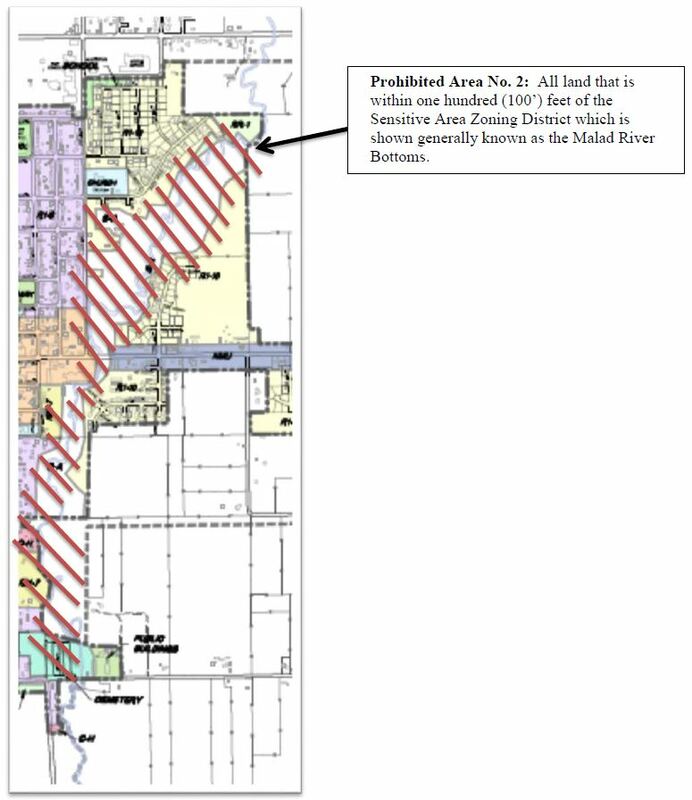 The ban also applies to all areas within 100 feet of the Malad River bottoms, where thick vegetation has become dry and highly flammable in recent weeks. WHEREAS, the City Council finds it is in the best interest of the City and the general health, safety and welfare of the public that this ordinance should be passed. 1. Definition. All terms relating to fireworks used in this ordinance shall have the same meaning as they are defined in Utah Code Ann. 53-7-202 of the Utah Fire Prevention Act. 2. Sale, Discharge and Possession of Certain Fireworks Restricted. a. It is unlawful and for any person to sell or offer for retail sale, or to discharge, or to have in their possession any fireworks in this municipality, other than class C common Utah state approved explosives used in accordance with, and only on the dates allowed, by Utah Code Ann. Sections 53-7-220 through 225; the rules adopted pursuant thereto; and this ordinance, except as otherwise permitted by state law. b. It is unlawful for any person to discharge any fireworks within 20 feet of any residence, dwelling, or structure. Prohibited Area No. 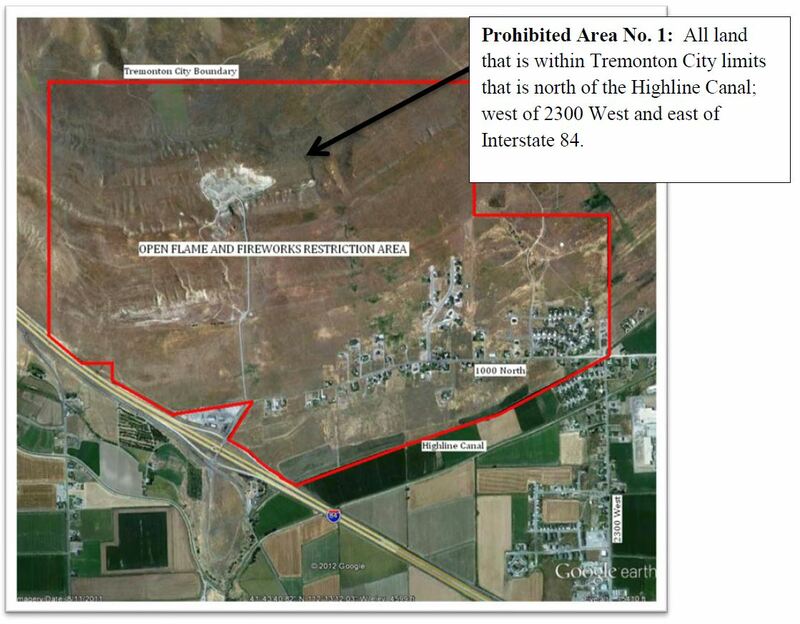 1: All land that is within Tremonton City limits that is north of the Highline Canal; west of 2300 West and east of Interstate 84, which is shown generally on the attached map contained in Exhibit A.
the attached map contained in Exhibit A. Marshal is hereby charged with the responsibility to enforce this ordinance. by both fine and imprisonment as set forth is Utah law. previously adopted by the City Council until this ordinance sunsets on December 31, 2017.
ordinance shall sunset on December 31, 2017. PASSED AND DATED this 18th day of July 2017.